With this pane of 16 stamps, the Postal Service brings Tyrannosaurus rex to life — some 66 million years after its demise. One design illustrates a face-to-face encounter with a T. rex approaching through a forest clearing; another shows the same young adult T. rex with a young Triceratops — both dinosaurs shown in fossil form. The third and fourth stamps depict a newly hatched T. rex covered with downy feathers and a bare-skinned juvenile T. rex chasing a primitive mammal. The “Nation’s T. rex,” the young adult depicted on two of the stamps, was discovered on federal land in Montana and is one of the most studied and important specimens ever found. 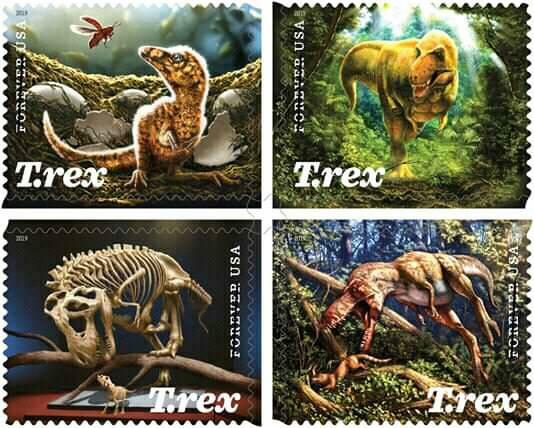 Its remains will soon be on display at the Smithsonian Institution’s National Museum of Natural History in Washington, D.C. Art director Greg Breeding designed the stamps with original artwork by Julius T. Csotonyi, a scientist and paleoartist. Halloween has long been a holiday that lets us delight in the things that scare us. With the approach of autumn, Spooky Silhouettes stamps will offer fun, frightful scenes that symbolize this annual celebration. 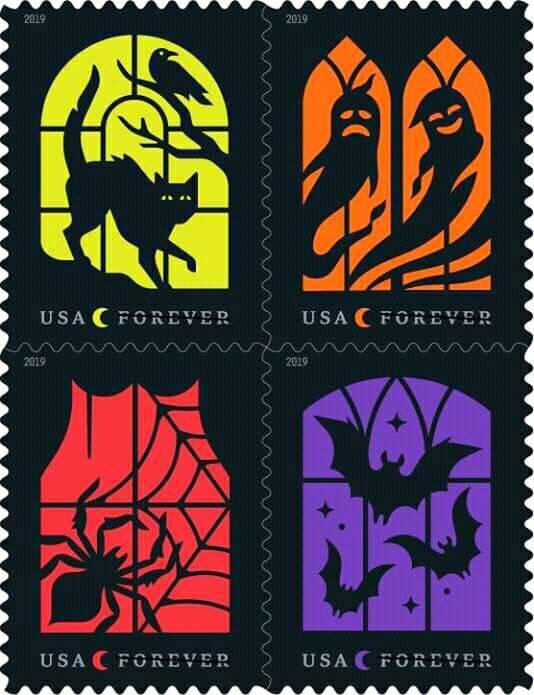 Four stamps feature digital illustrations in which traditional Halloween motifs are rendered as black silhouettes in eerily backlit windows. Artist Tyler Lang created the artwork. 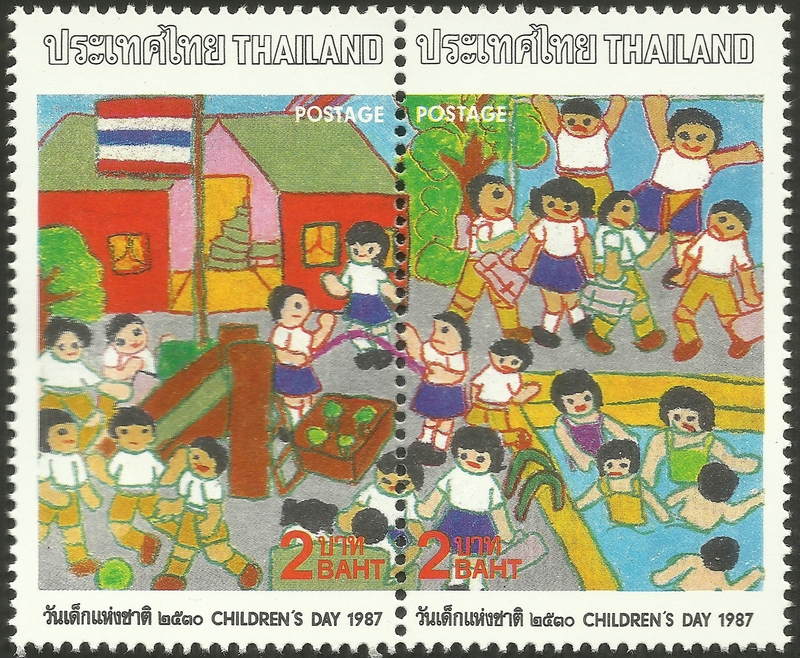 Art Director Greg Breeding designed the stamps. 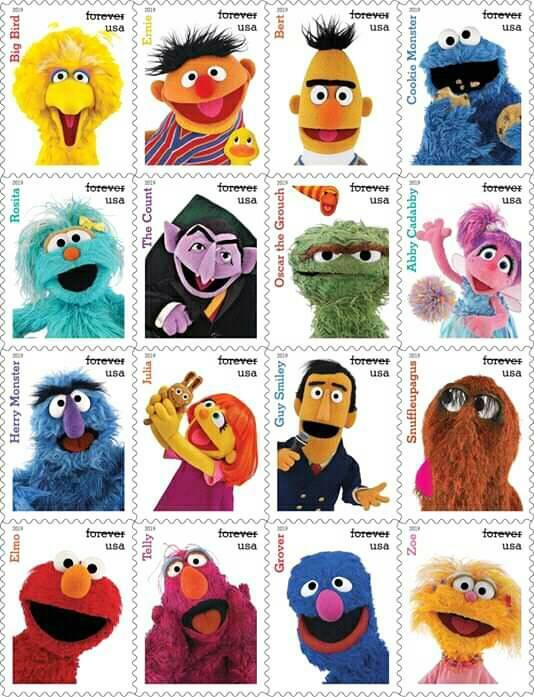 As a teacher, I should be thrilled with the Sesame Street stamps but I feel 16 different stamps is just too many. The T. rex stamps do nothing at all for me and we’ve had way too many dinosaur stamps already. I do like the design of the “Spooky Silhouettes” set, however. Any one of these could be the designated issue for National Stamp Collecting Month, or perhaps that will be the previously-announced (but no design yet revealed) Frogs issue. I love this stamp and hope that someday México will release one picturing a skeletal teacher (perhaps in front of a class of skeletal students); the annual Día del Maestro (Teacher’s Day) in mid-May is also annually commemorated with attractively-designed stamps. I am beginning to obtain a few of these in preparation for an “education on stamps” Topical Pursuits. This will probably appear a couple of months down the road. Last week saw very little time, once again, for any philatelic pursuits as it was the final week of the school year filled with testing and paperwork as well as an afternoon of activities for about 180 Kindergarten students. During the latter, I became quite dehydrated and nearly collapsed from heat exhaustion, having to cancel a business class later that evening. This week is perhaps busier (I am supposed to be on summer holiday) as I was asked to do a 10-day English camp in a temple school in the western portion of the island. I was told that the students would be high school level and spent several all-nighters preparing material for the camp (normally, we have weeks to put together these types of events). When I arrived, I found that the children were all between the ages of four and six and most had never even heard English spoken before! It has been a real struggle (none of the prepared material is appropriate and they won’t stay in one spot long enough for me to explain a game to them — nor would they understand if they did); I’ve been exhausted each evening and have been trying to pick “short subjects” for the A Stamp A Day articles. They have still taken about the same amount of time to put together each night as I have to constantly get up and walk around as my muscles tighten from the days spent chasing after tiny-tots. I will take a holiday once this camp finishes on March 23, which is two days before ASAD’s post #1000 and my planned hiatus from that. 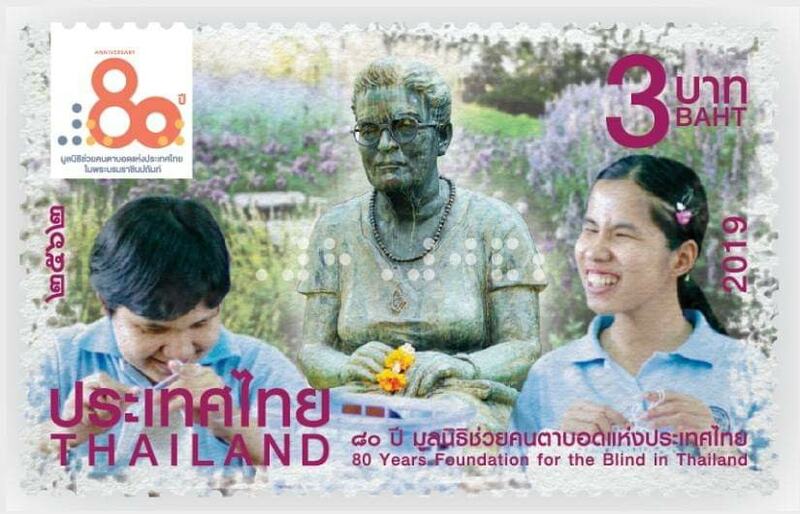 The next stamps to be released by Thailand Post will be the annual Thai Heritage Conservation Day issue on April 2. 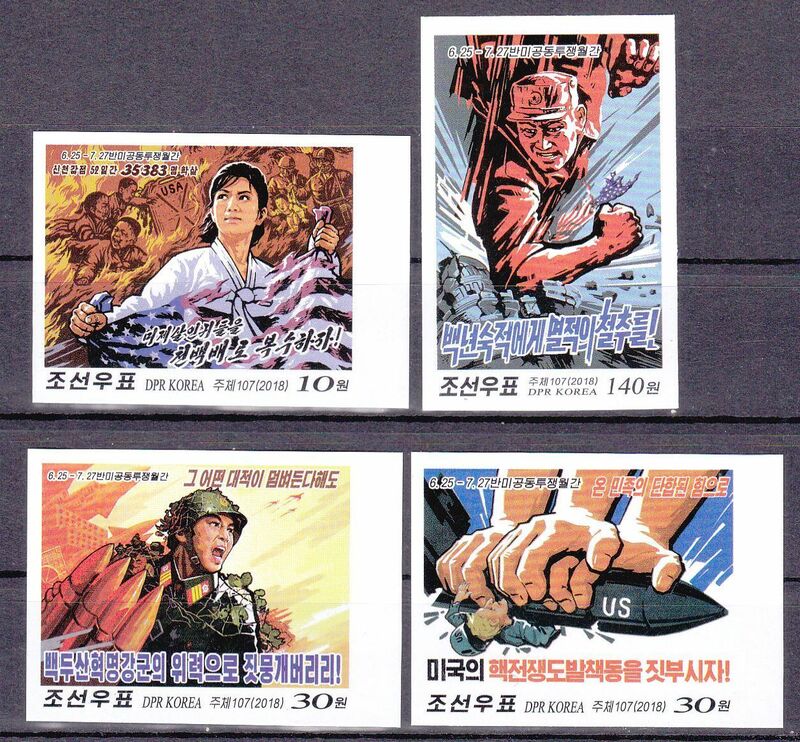 I have mentioned on this blog and elsewhere that I have long “enjoyed” collecting the propaganda poster stamps from North Korea, especially those issued around the time of the annual “Struggle Against U.S. Imperialism Month” which runs from June 25 until July 27. North Koreans flock to war museums such as the Sinchon Museum of American War Atrocities and attend rallies against the “evils” of the United States. Over 100,000 gather in Pyongyang’s Kim II Sung Stadium to speak out against “the fatty monster U.S. imperialists” as part of the ‘Mass Rally on the Day of the Struggle Against the U.S.”, An stamp issue has been a part of the anti-American celebrations off-and-on since 1952, with most featuring images taken from fairly graphic propaganda posters. Despite the June 12, 2018, summit between U.S. President Donald Trump and 3rd Supreme Leader of the DPRK Kim Jong-un (김정은) in Singapore last year, North Korea released their anti-U.S. stamp set right on schedule on June 25. One of my primary reasons for wanting to travel to North Korea was to easily purchase these stamps (and the associated post cards, propaganda poster books, etc.) directly from the source. I planned to use these to mail postcards to my home in Thailand and to various friends (although I don’t think I would have tried to send any to the United States). I do have other reasons for wanting to travel to this very strange place before it changes and had been close to booking a trip when President Trump basically made it illegal to travel there (since August 2017, Americans who have their passports scanned at a border checkpoint that points to a crossing into North Korea will generate a “revoke” code with the U.S. Department of State). I hope that the current round of talks will lead to a reversal of this policy very soon (the recent summit in Vietnam didn’t seem to end that well). The stamps on a postcard from there do not have to be anti-American to still be “cool”. For much more, please see my ASAD article from last year. 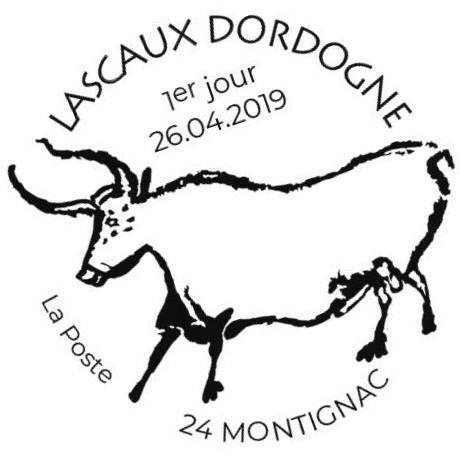 On April 26, La Poste of France will release a single stamp depicting the cave paintings of Lascaux Cave (Grotte de Lascaux) in a complex of caves near the village of Montignac, in the department of Dordogne in southwestern France. Over 600 parietal wall paintings cover the interior walls and ceilings of the cave. The paintings represent primarily large animals, typical local and contemporary fauna that correspond with the fossil record of the Upper Paleolithic time. The drawings are the combined effort of many generations, and with continued debate, the age of the paintings is estimated at around 17,000 years (early Magdalenian). 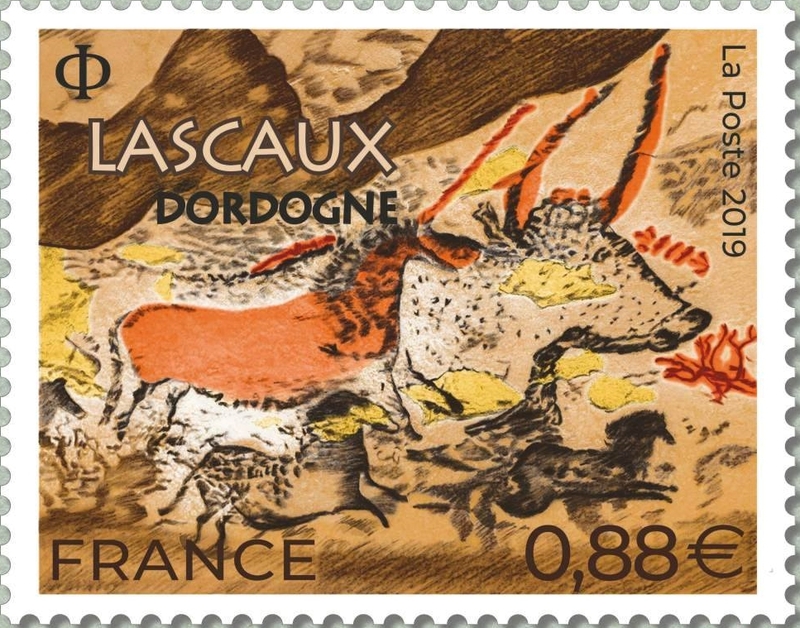 Lascaux was inducted into the UNESCO World Heritage Sites list in 1979, as element of the Prehistoric Sites and Decorated Caves of the Vézère Valley. Apparently, this is the first stamp France has issued honoring the site since 1968. That’s all I have for this week. Cheers!